Giant US clothing company American Apparel has been testing using RFID tags in-store to help with improving inventory accuracy and on-shelf availability. Imagine In-store RFID being used a step further when soon the tags embedded into your clothes or footwear let the store know what you have already purchased and start to serve you up ads / suggestions on what to buy next based on your previous purchases. Look out because it’s coming very fast to a store near you soon. After an extensive trial, they will be rolling this technology out across all US stores. “The Senitron solution delivers on the dream of hands-free, full-time inventory visibility,” “We get accuracy levels that meet or exceed handheld readers, in real-time and with less work. Stacey Shulman, CTO of American Apparel. If you really want to see what the possibilities are and how corporations really want to use this technology then you only have to read Spychips book written by privacy evangelist Katherine Albrecht . The system American Apparel is rolling out uses 12 – 15 uses fixed RFID antennas mounted among a store’s ceiling track lights. Imagine in the ‘possibilities’ area, that these readers know what you have purchased in the past, based on chips in your clothing or perhaps these readers could be used to read every credit card in your wallet. The technology is already there to do so. We don’t mean to be alarmist but this is how the technology will encroach even further into our lives, first it gets implemented as a ‘stock & inventory’ tool which no doubt is a useful tool, then it will be used as a marketing tool, think behavioural targeting in the online space now in the real world. Is your Privacy a myth? – Hollywood finally helps to put it out there. Hot on the heals from the fall out in the US of the NSA’s privacy scandal, Hollywood has timed this movie release beautifully, with everyone asking the question of how private is your personal data these days. 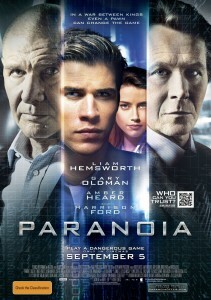 The movie tackles privacy issues we face daily in this age. It seems that Hollywood is catching on to what we have always been saying and that is…. This is a total 180 degree change, with the internet, social media channels, wireless technologies like Radio Frequency Identification (RFID) and Near Field Communication (NFC) our personal data is more open than ever before and easy for an organised criminal to use your personal data to clone your identity or know when your away from home so they can rob you. At ARMOURCARD we believe that you have a right to privacy. That is why we developed and patented the first ‘Active RFID & NFC protection device’ on the market. We are concerned, just like you, of managing your privacy and keeping things private. It is time to start taking back some of that power that has been relinquished through technological advances and social platforms. ARMOURCARD can help you! With our Active Protection Technology (APT), you can now jam out unwanted RFID & NFC tag interrogations of your credit cards, ePassports, enhanced drivers licenses and iD cards so no skimmer can read your personal data. (or credit card number etc) You can now be protected from this growing cyber crime of electronic skimming or pickpocketing. Start to take back your privacy – BUY ARMOURCARD TODAY!